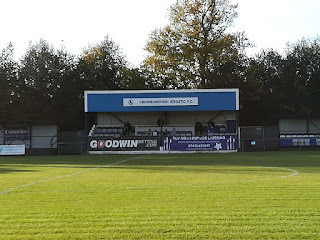 After a Saturday off from groundhopping last weekend, normal service was resumed this weekend with a tip up the A26 to Crowborough. 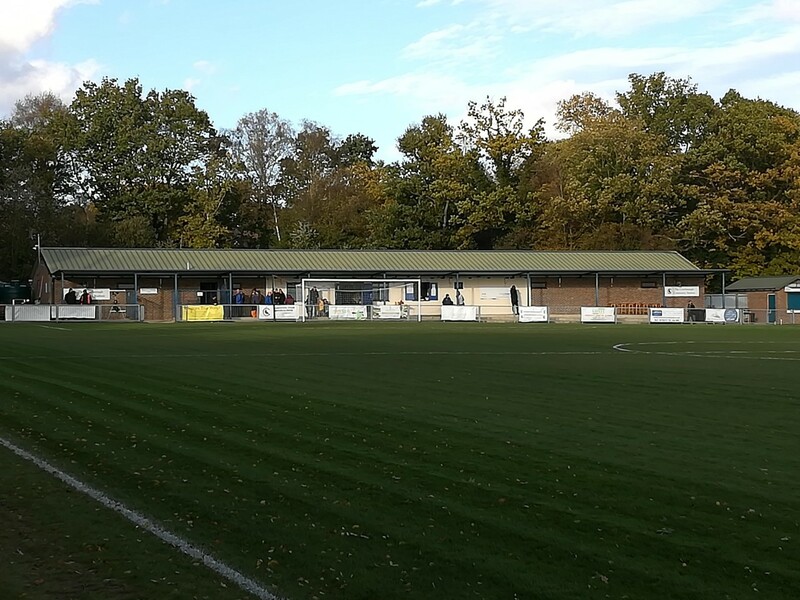 It was the lure of an East Sussex derby in the second round of the FA Vase – between Crowborough Athletic and Eastbourne Town – which ultimately tempted me to the Crowborough Community Stadium ahead of any of the other Vase games featuring Sussex teams. Yet while both of these clubs may hail from the same county, and play at the same level on the Non-League pyramid, they are not actually league rivals. 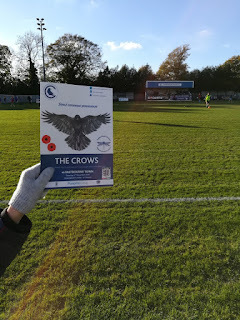 Bafflingly, for reasons that I don’t fully understand – and haven’t been bothered to find out due to my allergy to doing any research – Crowborough Athletic play in the largely Kent-dominated Southern Counties East Football League, as opposed to the Sussex-oriented Southern Combination Football League to which Eastbourne belong. This factor, however, only furthered the appeal of the match for me as it gave it more of a cup-feeling. Having noticed warnings on Crowborough’s Twitter feed that a larger than usual crowd was expected for the game, and that this meant parking spaces in the car park outside the ground could be at a premium, I decided to leave my house around 20 minutes earlier than I normally would have done to get to Crowborough. My dislike of walking further than I strictly need to closely matches my contempt for research! I was accompanied to the match by my eldest son, while my wife took the youngest to a party. In fairness to him, he’s much quieter than the youngest and a bit more ‘with-it’ when it comes to understanding the game, so the journey (and indeed the afternoon in general) is not peppered by the incessant non-sensical questions that I’m faced with when his brother is in attendance. An interesting thing that he did say to me on the drive up, though, was that he felt referees had an easy job. ‘All they have to do is give free-kicks and goals, and book and send people off,” he stated with the sort of misinformed innocence that only an eight-year-old can muster. I assured him that there was much more to it than that, and that being a referee is a thankless task. Not that I have any real experience, save from a few games reffing his under 9s team, which to be honest is enough for me. He still wasn’t having it, though, so I challenged him to ref the game as we watched it, and I’d tell him whether I agreed with his decision or not. I resisted the urge to do so by screaming obscenities in his face whenever I disagreed with his decision – I’ve mellowed since my own playing days. In fairness, he did quite a good job and I agreed with most of his calls, if not his choice to want to book or even send players off for every single minor discretion. I very much doubt, had he had his way, that there would have been enough players left on the pitch by half-time to finish the game if he’d been the man with the whistle. One Crowborough player in particular, Philip Appiah, should have been sent off about three times according to him, which was probably slightly harsh. That said, he was subbed at half-time so maybe The Crows manager, Sean Muggeridge, agreed with him. Anyway, I’m getting ahead of myself. We’ll get to the game shortly. We Arrivied at the ground at 2:15, and with the car park already starting to fill up, I was relieved to be waved into a parking spot by the stewards. It was £8 to get in (nothing for the boy), plus £1 for a program, which although fairly short on pages, was packed with plenty of information and gave all the required information plus a little more. Another really good effort. The ground is similar to many of those found at this level, which is no bad thing. 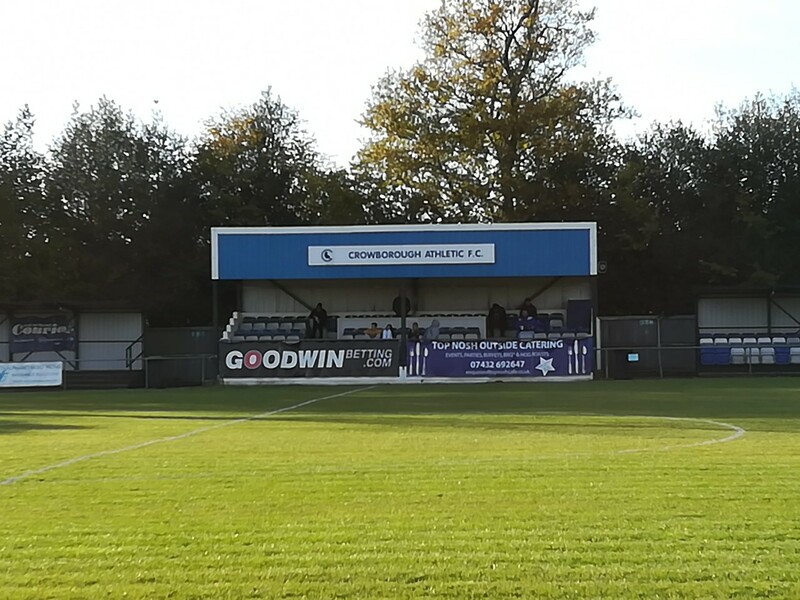 There’s a main seated covered stand on one side of the pitch, flanked by two smaller covered areas – one terraced and one seated. There is also a large terraced area behind the near goal, in front of the club house and changing rooms. This is probably the first proper bitterly cold day that I’ve experienced at a match so far this season, so we understandably elected to stand on the side of the pitch benefitting from the last rays of the dying afternoon sun. While this may have been good for keeping warm, relatively speaking, it wasn’t great for football spectating as the low sun played havoc at times with being able to actually view what was going on on the pitch. Not that the cold seemed to bother at least one member of the travelling contingent of Eastbourne Town fans who spent the entire game shirtless! Pure madness! The travelling Eastbourne fans, collectively known as Pier Pressure, are simply fantastic for the atmosphere they create. From the moment the match kicked off, right up until half-time (and then from after half-term to full-time), they were continually drumming, singing and dancing in one of the smaller stands that they had commandeered, creating a cacophony of noise, and generally having a great time (see the video for a very short snippet). Don’t get me wrong, if you happen to be watching an Eastbourne Town match whilst in possession of a hangover, then seeing this noisy band of supporters turn up is probably akin to being in Hell. Yet from what I heard (admittedly from the other side of the ground) there was no bad language used and no threatening behaviour. More fans like these would be a real asset to local football, in my humble opinion. Their joyful mood was no doubt aided by what they were watching on the pitch. 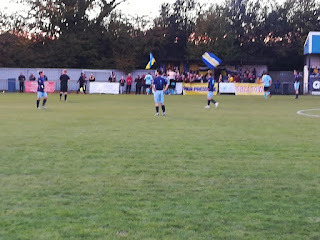 I had previously seen Eastbourne Town earlier in the season awayat Shoreham, when they had been similarly dominant but somehow ended up losing 2-1. A repeat was never on the cards today. Two goals in the space of five first-half minutes from George Taggart – the second an absolute ‘worldie’ in the words of my son – put Eastbourne in control and they never looked back. 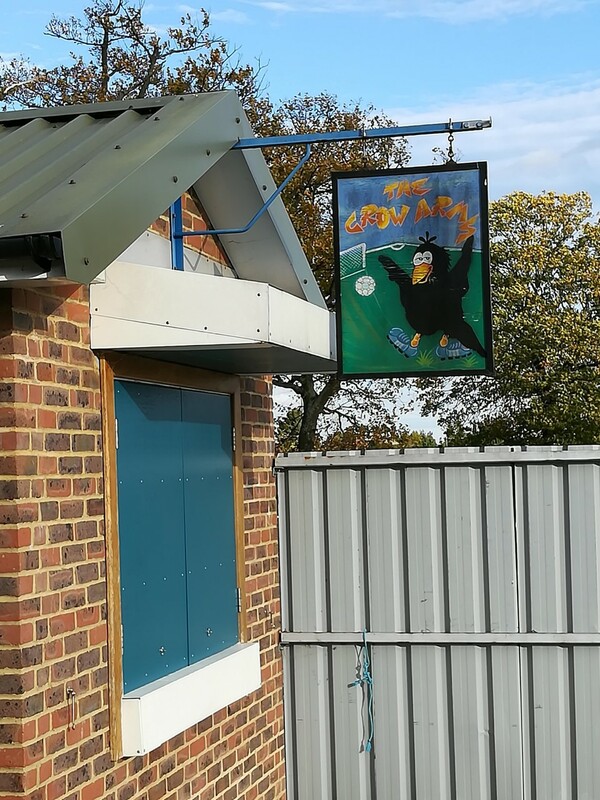 The depleted Crows – who had a number of players missing due to being cup-tied – battled hard, but struggled to create any real chances of note. In fact, the only real hope they had of getting back into the game was if they ran of the balls which sailed over the low surrounding fences at regular intervals and then seemed to take an age to be retrieved. (Well… that or the ref taking my son’s advice and sending all the players off). 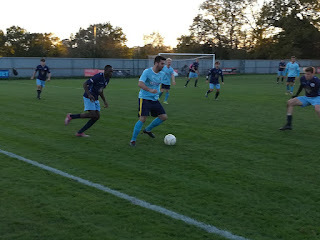 Perhaps had Town not scored a decisive third right on the stroke of half-time then the second-half may have been more competitive, but when Dan Bolwell did exactly that, finishing off a well-worked move, it was game over – and the Crowborough players and fans knew it. At this point, the Pier Pressure contingent were vocally baying for six goals – Crowborough had won 6-0 the last time the two sides met a couple of seasons ago and the visitors sensed the sweetest revenge. However, this never really looked likely as in the second half chances for both sides were at a premium. 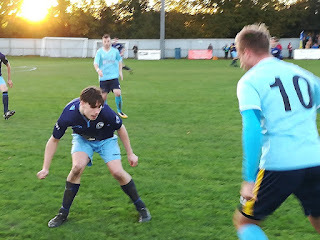 Town sensed they had already done enough to win the match; Crowborough probably had half-an-eye on damage limitation. 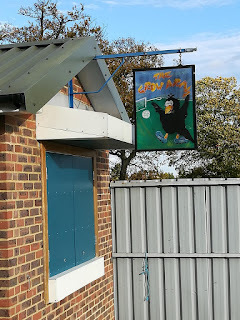 An Aaron Capon strike – which might have taken a deflection to wrong-foot The Crows keeper (who it has to be said was wearing one of the most shocking-looking goalkeeper jerseys I’ve seen for a long time) was all they had to show from a comfortable second-half performance. The fourth goal sparked yet more pandemonium from the visiting fans, with many of the players enjoying the celebrations with their loyal followers – the shirtless man, in particular seemed to be enjoying himself. 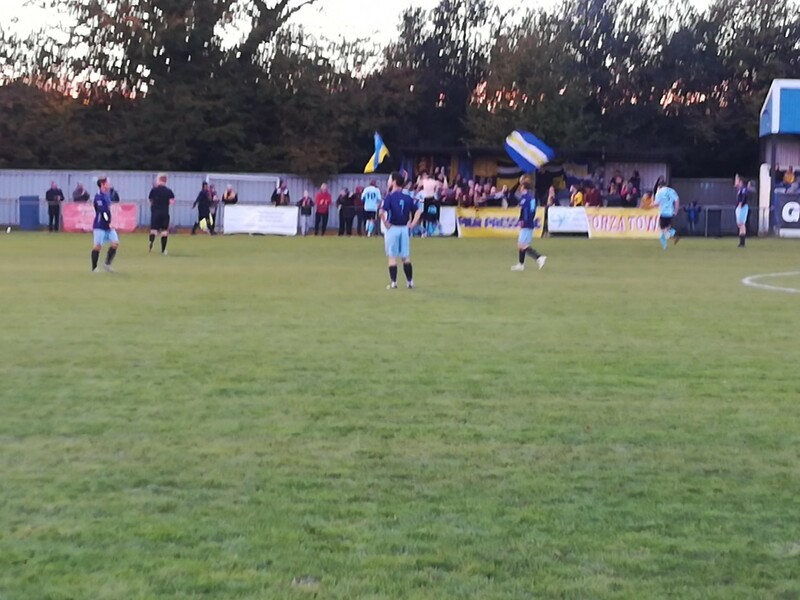 So Eastbourne Town advance into the third round of the FA Vase. If there was any real surprise to be had from the second-half, it’s that it took the travelling supporters until the 85th minute to burst into a rendition of Que Sera Sera. True, there’s a long way to go until the Wembley showpiece yet, but for Pier Pressure, and Eastbourne Town in general, the dream lives on for now.